Happy Monday, everyone! I have a couple of bright and juicy summer cards to share with you today using goodies from Waffle Flower Crafts. I like this company for their unique style and its always a pleasure to work with their products! 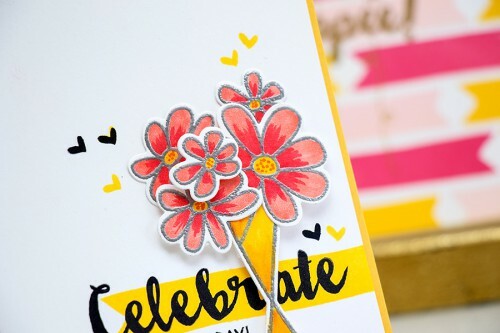 For the cards I’m sharing today I used a few of the stamp and die sets from their Spring release, all are linked at the end of this post. 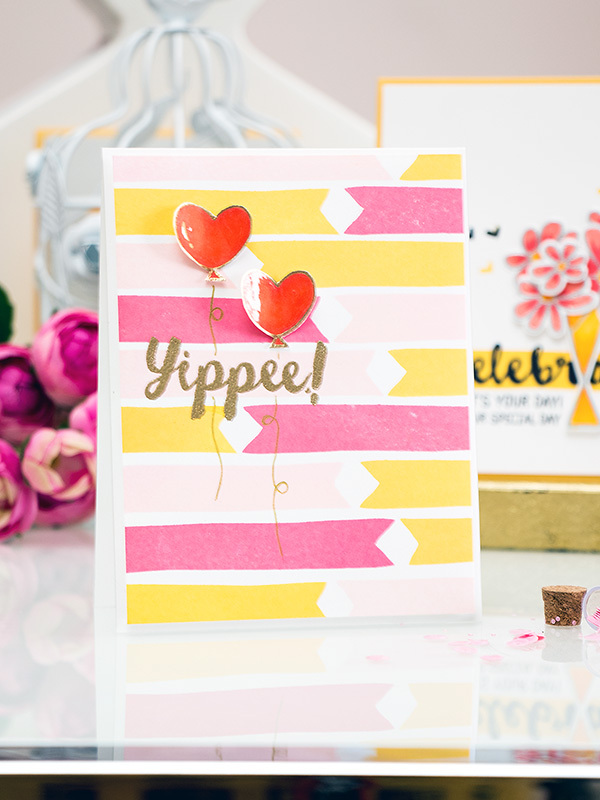 First up is a Yippee card with a fun colorful background created using a banner stamp from the Congrats stamp set; the Yippee sentiment and the cute balloon hearts are also from that set. I started working on this card by stamping a colorful background using a solid banner image. I used 3 colors of ink from Altenew – Coral Berry, Frosty Pink and Warm Sunshine. Since I was using just one stamp to create my background I wanted to work with inks that are easy to clean and therefore picked the Altenew inks as they do not stain stamps. I waited for the stamped background to be completely dry and heat embossed a sentiment in gold embossing powder from Hero Arts. I also heat embossed a couple hearts and colored them using Copic Markers, covered with Glossy Accents and adhered onto my card. The balloon strings were doodled using Gold Gel Pen from American Crafts. Because my background warped a bit from all the heat I had to adhere it onto a sheet of craft foam not only to help flatten it, but also to pop it up on my card for a bit of dimension. For my second project I used the beautiful A Bunch stamp set and matching dies. I heat embossed flowers in silver embossing powder from Hero Arts. Again I used Copics to color the images – I didn’t blend the colors but left streaks instead to give the petals some texture. I’ve never done this before and I have to say – I’m very happy with the way it turned out. I used foam dots to adhere most of the elements onto my white panel and than again craft foam to adhere the panel onto a card base for some added dimension. Finally for my 3rd project I used a fun Rosette Hearts die and die cut two hearts out of yellow cardstock. 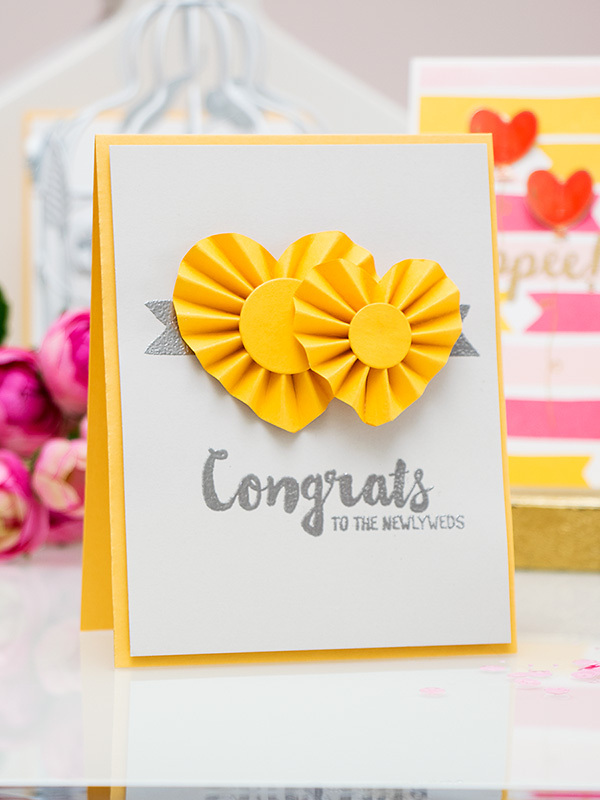 I wanted to keep this card simple, so I only added a heat embossed banner and sentiment in silver and adhered this panel onto a yellow card base. Like this video? Please give it a thumbs up and share with friends, thanks! beautiful cards. 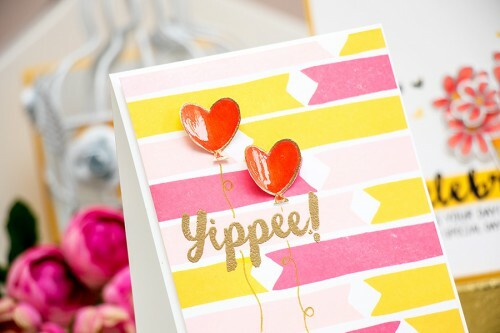 I love the heat embossing and bright colors. Hana – my favorite is the “Yippee” card. I love the banner background!! You make me want to get out my gold embossing powder. I use to use it all the time, but for some reason, I stopped. Thank you for sharing! Love these cards Yana, they are awesome! Beautiful cards with an interesting color combination. 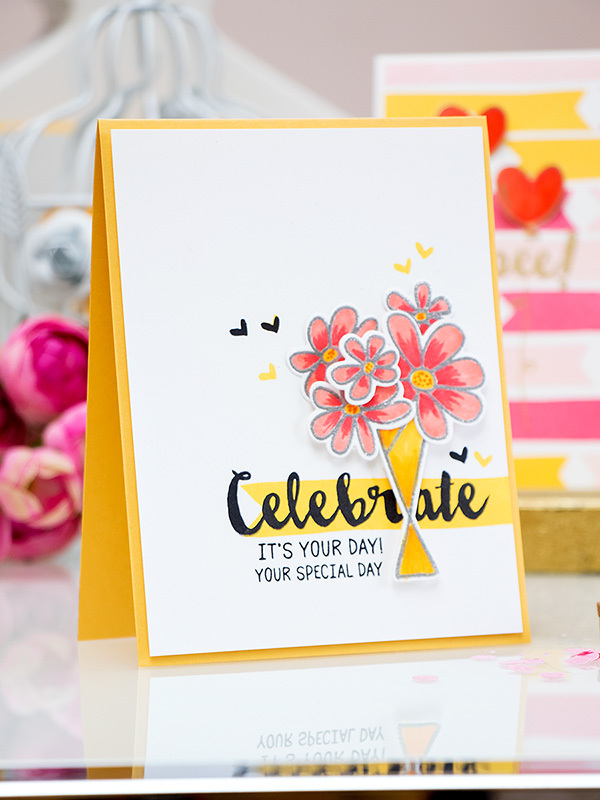 I love to make my own backgrounds too so I guess my favorite would be the banner background – but as I say that I love the way you did the dimension on the flowers on the flower card – both winners! Thank you for sharing.